The necropolis and the ritual structures are situated 2 km southeast of the village of Dubene, Karlovo region, between the Stara Planina and the Sredna Gora mountains in southern Bulgaria. The necropolis encompasses at least nine separate mounds, four of which are smaller and lower and five are larger and higher. The larger mounds reach 25 m in diameter and 2.70 m in height. The lower mounds, situated among the high ones, differ in diameter, ranging from 5.50 m to 14.50 m, while their height reaches 25cm above the surrounding terrain. Some mounds were dug to a depth of 60 cm into the ancient terrain, and most often ceramic vessels – at least four and sometimes more than five – were deposited in them. They were covered with a layer of stone pebbles of different size, which were heaped immediately above in a thickness up to 40 cm. In some of the structures the pebbles were mostly medium sized, while in one structure the covering was composed of large pebbles only. The mounds should be dated to the third stage of the Early Bronze Age (Early Bronze Age III) in Thrace in the Bulgarian periodisation (Лещаков 2006, 177–182), that is, the late third millennium BC (Христов 2005; Hristov 2006). A settlement was located 400 m southwest of the necropolis and the structures; it was inhabited continuously during the Early Bronze Age. Thus, the necropolis is likely related to it. The structure was investigated in 2004. However, looters’ trenches as well as numerous agricultural activities in the terrain have almost ruined this archaeological structure. Pebbles from the covering were scattered mostly in a southerly direction, and only a short curve in the northern part of the area under study could be regarded as part of the original stone covering. The pebbles there are of medium size, although some are larger. Sherds of at least five clay vessels and numerous gold items were found interspersed in the soil. The finds include: biconical beads, ring-shaped beads of small, medium and large size, small cylinders, round appliqués with decoration in relief, convex appliqués with attachment openings, a spacer, a prismatic plating with almost square cross-section, axe-shaped items, a spacer for beads, an element for bead-production with 11 holes, and a spiral (one and a half coils) pendant. Due to the severely disturbed structure of the mound, no bones were found. This was the northernmost of the smaller mounds; it was investigated in 2005. The pebble covering was 9.44–9.95 m in diameter and 30 cm thick. There was a shallow hollow dug into the mound that measured 6.90 x 7.30 m and up to 20 cm in depth. Eight deep (up to 1.10 m) and narrow pits (maximum diameter 0.80–1.05 m) had been dug next and were found filled with pebbles. These pits form a rectangular area with a northwest-southeast orientation and an apse in the southeastern wall, formed by one pit positioned slightly farther away. At least five different shapes of ceramic vessels – bowls, cups, pitchers, etc. – had been deposited in the central area of the mound. Some small fragments of bone and tooth enamel that bear traces of cremation were found among them. 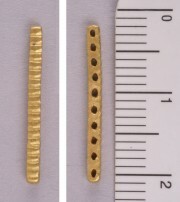 In addition, various gold elements from necklaces and small objects were found, including gold spirals, small ring-like beads (diameter up to 2.7 mm) with and without incisions across the peripheral edge, a small spheroid bead with deep relief on the outer edge, as well as two necklaces of beads. The necklaces might have been broken during their positioning among the other funerary offerings and in the process of building the stone covering, as many of the beads lay around and upon the vessels. Oppositely, the number of beads found scattered in the soil among the pebbles in the lowest two layers was significantly less. This mound reaches a height of 2.70 m and has a diameter of 25 m. Its embankment revealed two stone covers, the lower of which did not encompass the whole area of the mound. A burial was revealed underneath the stone cover. The skeleton lay in a shallow pit, and its head was in a west/southwest direction. Eleven gold biconical beads and a spiral were found to the north of the skeleton, to the south the golden end-piece of a scepter or of a dagger. Pebbles of medium size were found 25 cm below the surface of the terrain. They had survived in situ and represent part of the stone cover of a ritual structure. Several ceramic vessels were also discovered in situ below this. Some of the vessels are richly decorated with incised and white-incrusted ornamentation. One vessel is a bowl that was found in an inverted position and covered by two other vessels. In addition, a fragment of gold plate, a silver lidded box, a small ceramic cup that combines Thracian and Aegean-Anatolian elements – evidence of contacts with Asia Minor during the Early Bronze Age III – and a bronze knife with two gold plate elements on the grip were recovered. 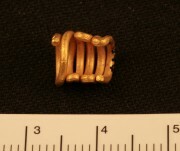 More than 5,479 gold items: spirals, spacers and beads (up to 4.3 mm in diameter), small fragments of bone, a silver dagger, a gold dagger and glass beads, were found south of this vessel and among the other bowls, dishes, etc. Six heaps of pebbles were discovered around the ceramic vessels. During excavation it could be determined that these pits were filled mainly with pebbles of medium size. A ceramic vessel with a cup of the Yunatsite type deposited inside of it was found in Pit No. 1, while Pit No. 2 contained ceramic sherds. The pits differ in size. The discoveries of vessels in Pit No. 1 as well as the shallowness of three of the remaining pits suggest that a correction should be made to my preliminary view that was based upon the data from Ritual Structure No. 3: namely that the pits filled with pebbles had supported a wooden construction (Христов 2005, 129; Hristov 2006, 27). Now it appears more probable that they had served for entirely ritual functions and marked the space in which the ceramic vessels, the metal and glass object were to be deposited. Ritual Structure No. 5 partly repeats the situation in No. 2: the pits, which here are six in number, mark a rectangular space with northwest-southeast orientation, where the offerings had been deposited. This relates the two structures as constructions and gives reason to believe that Ritual Structure No. 5 likewise had once had a stone covering that could be interpreted as a sealing. This structure displays damages from the activities of looters: a pit of 60-cm depth was dug almost in the centre of the structure. The stone covering was almost circular and 14.50 m in diameter (Fig. 2). It encompassed two different kinds of pits. One was nearly oval with a maximal diameter of 8.40 m and a depth up to 36 cm. Fragments of three ceramic vessels, bowls and a cup, as well as 15 gold beads were found in its center. The ceramic sherds date this context to Early Bronze Age III. A second pit was located near the oval one. Its maximal width was 2.70 cm, and it can be compared to a ditch. Pebbles as well as one rock had been deposited in it. These stones were very large, some reaching 70 cm in length. The two pits were covered with pebbles of medium size. This was the first structure of such character to be investigated at this site. The numerous gold items that were found in the seven structures studied so far has analogies and parallels in earlier and later complexes in a territory that extends from Asia Minor to Central Europe. Foremost among these are materials from Poliochni, Leukas, Troy, Alepotrypa Cave and Eskiyapar, some of which are dated to Early Bronze Age III. Typologically, part of the objects are the earliest yet and find parallels in complexes from the Middle Bronze Age in Gălăbovo and Ovchartsi, as well as in material from sites outside Bulgaria, for example, material from the necropolis in Mokrin (Early Bronze Age III), in Franzhausen (Middle Bronze Age) and in Tiszafüred-Ásotthalom in Hungary (Middle Bronze Age). However, I could not find analogies in archaeological literature for certain artifacts, such as the spacer elements, the axe-shaped items, the plating elements, parts of spirals and some appliqués. Some objects from the mounds near Dubene have good parallels among the finds in Bulgaria, for example the necklaces of biconical and cylindrical beads discovered in the village Rupite, Petrich Region. 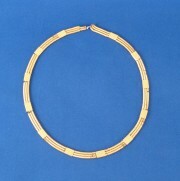 Some elements and objects are technologically very impressive and show a high level in the production of gold adornments and in the various techniques that accompanied it during the Early Bronze Age. The concentration of such a quantity of gold items and ornamental elements within the framework of several mounds of one necropolis suggests that they were produced in area of the settlement and the necropolis or in the vicinity. This is supported all the more by the fact that ancient gold was most often attained from placers. Thus, the gold-bearing tributaries of the Maritsa River and the Stryama River itself may be considered as an indirect proof. The appearance of certain types of gold objects during Thracian Early Bronze Age III is probably due to the influence or to direct trade contacts with Asia Minor in the southeast and with the northern Aegean in the south during the Early Bronze Age II–III or Early Bronze Age III. This is supported in part by the analysis of the ceramic material from some settlements in Thrace. The appearance of new shapes in Dubene is probably due to the further development in the production tradition of gold ornaments. During the Early Bronze Age III this part of the present-day Bulgaria exerted an influence to the north and most of all to northwest. This tendency is illustrated, for example, by the spirals with one and more coils turned in reverse and by the convex appliqués. In this respect, the necropolis near Dubene presents the link between Europe, Asia Minor and the Near East during the Early Bronze Age. Such links can be proven in the territory of present-day Thrace and in western Bulgaria for a period not much later during the Early Bronze Age, that is, the beginning of the Early Bronze Age III. Imported vessels found in Thrace are also dated to the same period. There are almost contemporaneous finds in complexes in Serbia, while some shapes already reached Central Europe during the Middle Bronze Age. Thus, the central Balkans and the materials discovered near Dubene present a link in the contacts between these parts of the world during the Early and the beginning of the Middle Bronze age, and they form a straight line of influence from the Southeast to the Northwest. Undoubtedly, gold was a symbol of prestige at the end of the Early Bronze Age in Thrace, considering the number of the finds and the fact that they are mostly adornments. The object interpreted by us as the end-piece of a scepter or a dagger with a gold-plated grip is additional proof of this. At the same time, if we accept the theory that the adornments were manufactured locally, this would also be indirect evidence for the existence of a certain organization in production. This activity would have been organized, limited and strictly specialized, and furthermore practiced by only few representatives of the population, just as the production of bronze items, and most probably the manufacture of pottery, etc. The existence of some kind of organization in Early Bronze Age III society is also confirmed by a series of other data. One of the most important questions is the interpretation of the various structures as well as the entire site. The bone material presents one of the most crucial arguments in this respect. The bones that could be identified proved to be of animal origin. In my opinion, the term “ritual structures” is the most appropriate at this preliminary stage of interpreting the archaeological situation and materials. As a whole they are reminiscent of a “burial” or symbolic deposition of offerings in the small mounds: ceramic vessels, gold, bronze and stone objects, all compatible with the presence of animal bones and the “sealing” with a covering of pebbles. Thus, from a constructional standpoint, these structures bear features of tumuli with a stone covering, whereas in practice they are rather connected with ritual. Indeed, why not with religious practices of the Early Bronze Age. If we accept this possibility, then the site presented here is a necropolis and the ritual structures are a new kind of a sanctuary, as indicated by the small mounds connected with ritual activities. Two different zones are distinguishable at this stage of study at the site: I designate them as ‘necropolis’ and ‘ritual structures’ as technical terms only. The first one embraces the five larger mounds, one of which contains actual burials (the other four probably contain burials as well but they have not been investigated yet). The second zone comprises the small mounds, i.e. ritual structures in which the items – bronze, gold, glass, ceramic, animal bones, etc. – were most probably ritually buried. The discovery of so many gold objects in Thrace is not unusual; indeed it is quite expected. Through these this part of southeastern Europe corresponds fully with the “boom” in the production and use of gold during the Early Bronze Age and is equivalent to Asia Minor, the Near East and the Caucasus, at least from a purely statistical point of view. Thus, these finds fall within the southern metallurgical circle of the Circumpontic metallurgical province. Last but not least, I would like to note the significance of this study as concerns the formation of Thracian society, known from written sources that describe events relating to the Late Bronze Age. The amassment of such quantities of objects, made of metals which at that time were considered very precious, is clear evidence of the consolidation of the population. Лещаков, Кр. 2006. “Бронзовата епоха в Горнотракийската низина.” Годишник на Софийския университет «Св. Климент Охридски». Исторически факултет – специалност Археология 3:141-216. София. Христов, М. 2005. “Некропол от ранната бронзова епоха край Дъбене, Карловско (предварително съобщение).” Археология 2005, 1-4:127-137. Hristov 2006: Hristov, М. 2006. “Gioielli d`oro del III millennio A.C.” In Tesori della Bulgaria. Dal Neolitico al Medioevo, 27. Roma. Hristov, M. "Necropolis and Ritual Structures from the Early Bronze Age near the Village of Dubene, Karlovo Region." 10 Apr. 2007. In: Horejs, B. - Pavúk, P. (eds. ): Aegean and Balkan Prehistory. http://www.aegeobalkanprehistory.net/index.php?p=article&id_art=3 (23 Apr. 2019).